Need a plan to ensure success? One-on-one personal training with programs designed based upon a comprehensive health & fitness assessment, lifestyle and goals. Improve posture, muscle imbalances and strengthen your core for a better functioning musculoskeletal system. Learn the best way now! Contact me for more info. Want to train with a friend or your partner? Studies have shown that people that work out with a partner have a higher probability of success in achieving their health and fitness goals. Enlist a buddy and get started! Contact me for more info. Thinking of running a 5K, 10K, Half Marathon or Marathon? Anything is possible with the right guidance. Coaching ensures you are running the right amount, at the right times, with the right intensity with the best form. Learn correct running form, how to cross-train, nutrition tips and when to rest to keep injury-free. 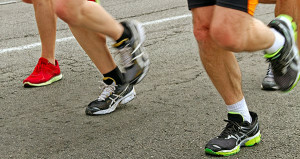 Lace up your appropriate running shoes and start running today! Contact me for more info. Thinking of Try-ing a Tri? Anything is possible if you are willing to commit your time and do the work. Triathlons are like solving a mathematical equation. If you successfully complete all the variables, training, rest & nutrition, you will find the solution to cross the finishline. Coaching ensures you are following the best program, based upon your skill level, using proper technique & gear and incorporating strength & flexibility training to prevent injury. Includes monthly testing to monitor progress. Get the guidance and courage to go the distance! Contact me for more info.